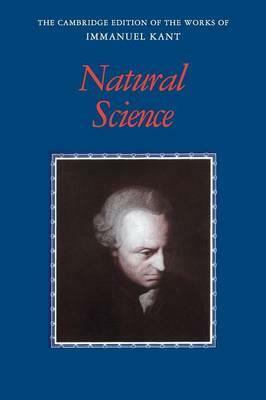 Though Kant is best known for his strictly philosophical works in the 1780s, many of his early publications in particular were devoted to what we would call 'natural science'. Kant's Universal Natural History and Theory of the Heavens (1755) made a significant advance in cosmology, and he was also instrumental in establishing the newly emerging discipline of physical geography, lecturing on it for almost his entire career. In this volume Eric Watkins brings together new English translations of Kant's first publication, Thoughts on the True Estimation of Living Forces (1746-9), the entirety of Physical Geography (1802), a series of shorter essays, along with many of Kant's most important publications in natural science. The volume is rich in material for the student and the scholar, with extensive linguistic and explanatory notes, editorial introductions and a glossary of key terms. 1. Thoughts on the true estimation of living forces and assessment of the demonstrations that Leibniz and other scholars of mechanics have made use of in this controversial subject, together with some prefatory considerations pertaining to the force of bodies in general (1746-9) Translated by Jeffrey B. Edwards and Martin Schoenfeld; 2. Examination of the question whether the rotation of the Earth on its axis by which it brings about the alternation of day and night has undergone any change since its origin and how one can be certain of this, which [question] was set by the Royal Academy of Sciences in Berlin as the prize question for the current year (1754) Translated by Olaf Reinhardt; 3. The question, whether the Earth is ageing, considered from a physical point of view (1754) Translated by Olaf Reinhardt; 4. Universal natural history and theory of the heavens or essay on the constitution and the mechanical origin of the whole universe according to Newtonian principles (1755) Translated by Olaf Reinhardt; 5. Succinct exposition of some meditations on fire (1755) Translated by Lewis White Beck; 6. On the causes of earthquakes on the occasion of the calamity that befell the western countries of Europe towards the end of last year (1756) Translated by Olaf Reinhardt; 7. History and natural description of the most noteworthy occurrences of the earthquake that struck a large part of the Earth at the end of the year 1755 (1756) Translated by Olaf Reinhardt; 8. Continued observations on the earthquakes that have been experienced for some time (1756) Translated by Olaf Reinhardt; 9. New notes to explain the theory of the winds, in which, at the same time, he invites attendance at his lectures (1756) Translated by Olaf Reinhardt; 10. Plan and announcement of a series of lectures on physical geography with an appendix containing a brief consideration of the question: whether the West winds in our regions are moist because they travel over a great sea (1757) Translated by Olaf Reinhardt; 11. New doctrine of motion and rest and the conclusions associated with it in the fundamental principles of natural science while at the same time his lectures for this half-year are announced (1758) Translated by Olaf Reinhardt; 12. Review of Silberschlag's work: theory of the fireball that appeared on 23 July 1762 (1764) Translated by Eric Watkins; 13. Notice of Lambert's correspondence (1782) Translated by Eric Watkins; 14. On the volcanoes on the Moon (1785) Translated by Olaf Reinhardt; 15. Something concerning the influence of the Moon on the weather (1794) Translated by Olaf Reinhardt; 16. Physical geography (1802). '... this volume is a much-needed, very valuable contribution to scholarship. It brings together important texts by an important philosopher, readably translated and edited to the highest standards in the field. It will easily become the new reference work on Kant's natural-scientific output and will foreseeably remain the standard text for decades to come.' Metascience 'The value of this publication is conspicuous given that it brings together Kant's specialised works on natural science and makes them available in English translation, some of them even for the first time ... this volume can be extremely helpful for historians of astronomy and Kant scholars who are interested in assessing the extent to which Kant influenced his contemporaries and immediate successors.' Silvia De Bianchi, Journal for the History of Astronomy "... this volume is a much needed, very valuable contribution to scholarship. It brings together important texts by an important philosopher, readably translated and edited to the highest standards in the field. It will easily become the new reference work on Kant's natural-scientific output and will foreseeably remain the standard text for decades to come." Marius Stan, Metascience "The value of this publication is conspicuous given that it brings together Kant's specialised works on natural science and makes them available in English translation, some of them even for the first time ... this volume can be extremely helpful for historians of astronomy and Kant scholars who are interested in assessing the extent to which Kant influenced his contemporaries and immediate successors."